Sometimes I feel there’s this imaginary divide in my brain between “regular” cooking and “fancy” cooking. 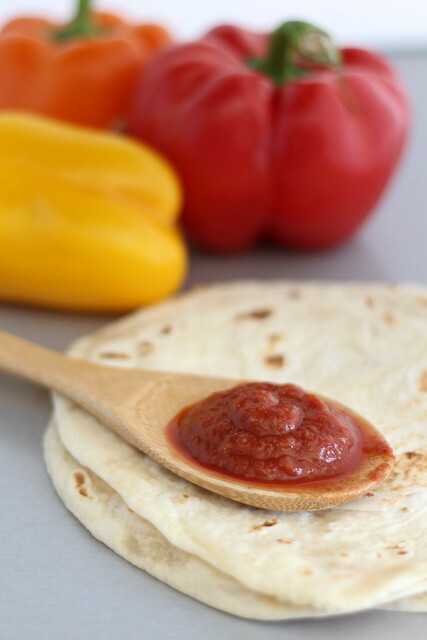 Regular cooking is the sort of throw-it-together meal that happens on a busy weeknight, like sandwiches or quesadillas, while fancy cooking involves an extensive ingredient list or a dish that I would be more likely to order at a restaurant than make myself. For whatever reason, chilled soup always seemed to be fancy cooking for me. Do people actually make cold soup, or is it just something to be served in tiny little cups as an amuse bouche at the beginning of a rather expensive meal? Surprise! It turns out chilled soups are nothing more than regular soups with an ice bath thrown in for fun. I made this lovely, fragrant pea soup this week and served it for dinner with a homemade baguette and ricotta cheese. It was a quick and easy meal that certainly felt special. Plus, we dined al fresco, which is “fancy cooking” for outside on the balcony in the late evening sun. Heat olive oil in a large saucepan over medium heat. Stir in shallots and cook for 2-3 minutes, until soft. Stir in peas and sauté for 2 minutes. Add stock and bring to a boil. Reduce heat and simmer for five minutes. Remove from heat and let cool for 10 minutes. 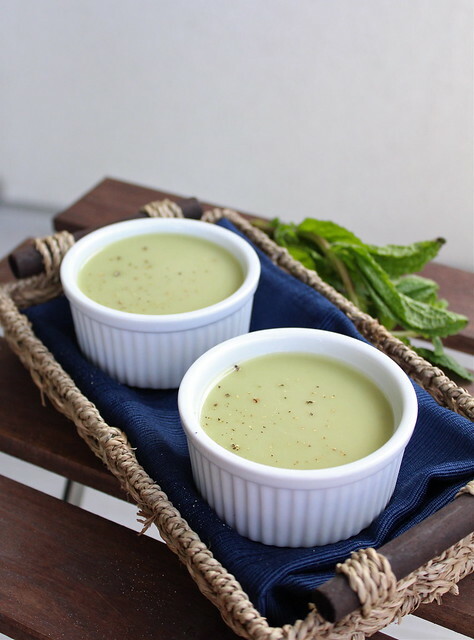 Stir in mint leaves, then blend using an immersion blender until smooth. (You can also use a regular blender, just do it in batches.) Season with salt and pepper to taste. Pour soup into a bowl over an ice bath and cool, stirring occasionally. Finish chilling soup in the refrigerator, then serve. Source: Williams-Sonoma Cooking for Friends. Nutrition facts (per serving): 130 calories, 4.9 g fat, 17.1 g carbs, 4.2 g fiber, 4.5 g protein. Holy schmoly, it’s been a whole month since I’ve posted. Uffda. First there was Hawaii, then the Cape, then the end of my internship, then the start of a new semester. My cooking this month has basically revolved around sandwiches and sausages. And one happy batch of popovers. Last night I decided to get myself back into cooking mode– something I’ve desperately missed– by trying my hand at chocolate soufflés. 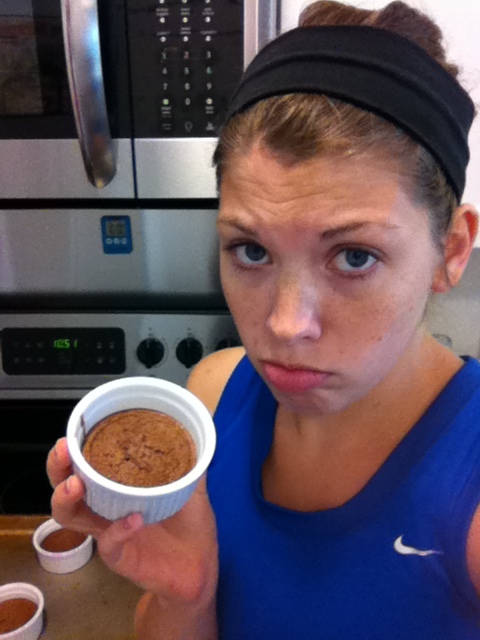 I understand the basic principles of soufflé-making and have used the techniques in other recipes before, like molten chocolate cakes. Nothing was terribly new or frightening. But last night was a bust. I turned away from my mixer for one second and looked back to find clumpy, overbeaten egg whites. Being stubborn (or curious?) I decided to forge ahead, knowing in my heart of hearts that the soufflés wouldn’t rise but hoping I could prove the laws of physics wrong. Nope. Physics won. And while the dessert still tasted okay, it didn’t have the airy texture or dramatic puff intrinsic to a true soufflé. Sufficiently humbled, I sighed and vowed to try again someday. Luckily I’m resilient (or naive) enough that experiences like this don’t dissuade me from kitchen challenges for long. Besides I just saw a recipe in Food Network Magazine for homemade candy corn. Bring it on. It’s still hard to type these words. I have a sympathy card sitting in my desk drawer, addressed and stamped, but never sent. As if the funeral wasn’t final enough. As if the simple act of writing and mailing this one card would confirm that my dear friend was actually gone. A year has gone by. The return address label on the envelope is no longer accurate. And still I haven’t sent the card. My plan for marking the anniversary of Sara’s passing was to create a dish combining two of her favorite foods: tiramisu and popcorn. 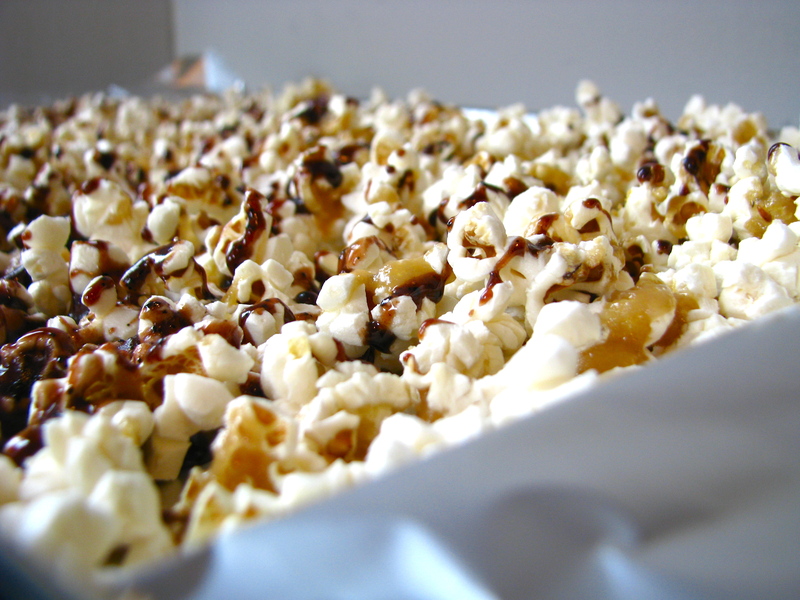 I swirled together sugar and mascarpone, espresso and chocolate, and drizzled it over freshly popped popcorn. It was beautiful. Sadly, it did not taste very good. I have to work on my recipe-creating skills. But the sentiment is there. Sara, I see reminders of you everyday. In card games, cooking shows, the giggles of children, and most of all, in people’s smiles. 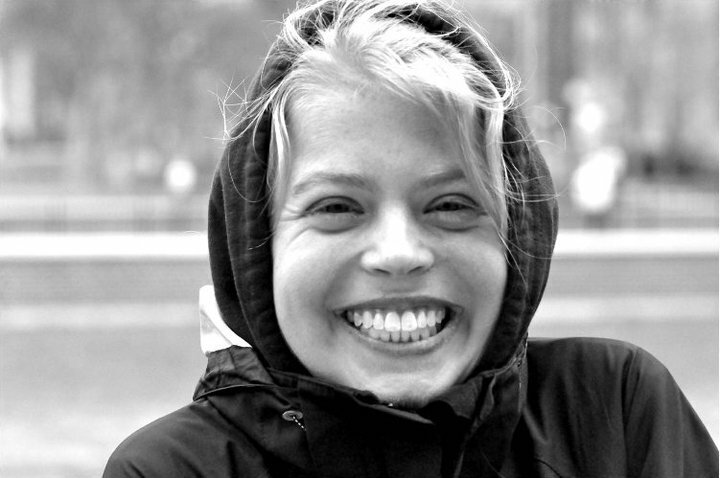 No one can hold a candle to your mega-watt grin, but I see glimpses of those smiles in others. Especially in your sister. And in my own sisters. And in so many others who were indelibly blessed by your short life. I miss you today, and everyday. I love you, Sara Nan. Don’t Run Barefoot in the Kitchen! 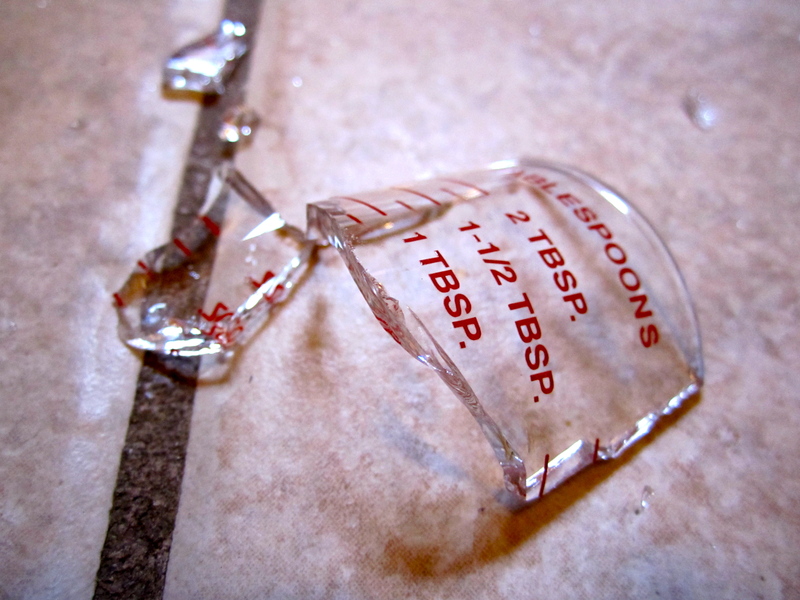 While engaging in a furious candy making session this morning, I accidentally knocked my favorite shot glass/ measuring cup off the counter and onto the tile floor. I couldn’t stop to clean up the glass right away, so I put on a pair of shoes and quickly swept the glass into a concentrated pile on the floor. This worked well for about ten minutes, until I accidentally kicked the pile and sent shards flying everywhere. Oops. One result of spending the morning on my hands and knees on the kitchen floor is that I discovered some messes in my kitchen. 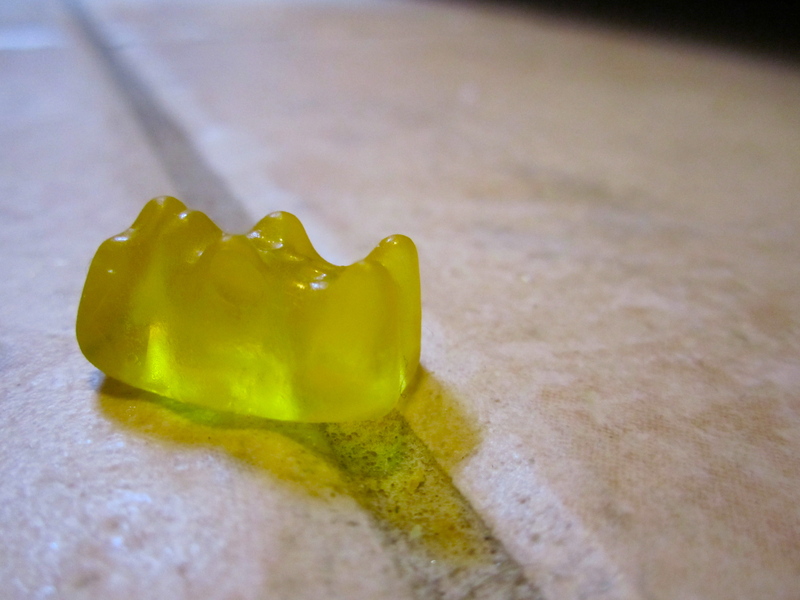 My baseboards are covered with coffee grounds and I even found a rogue gummy bear. But I have two papers to write, so I guess the extensive cleaning will have to wait! 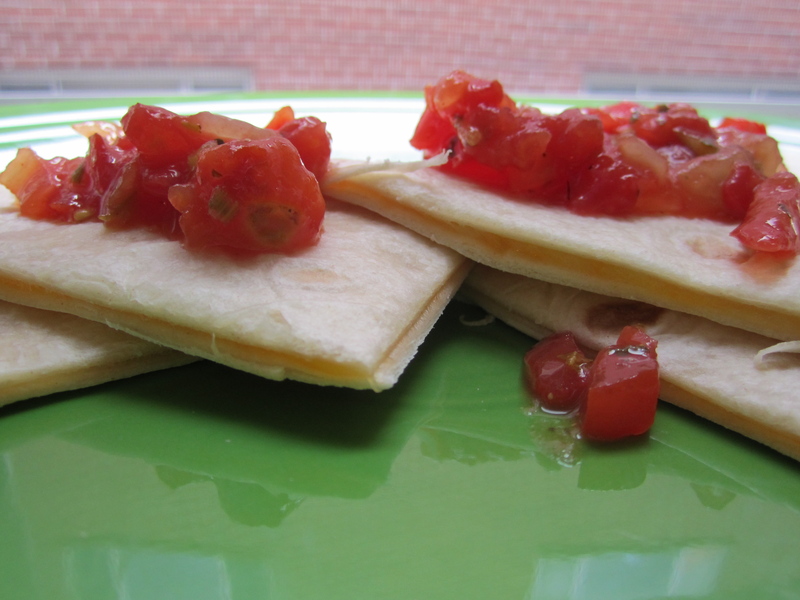 This blog is primarily about how much I love the challenge and joy of making delicious meals from scratch. Reading it, you might think that we eat gourmet, homemade food all the time. Newsflash! We also eat a lot of sandwiches. And sometimes even canned baked beans. Really, my blog (like any cooking blog) is all about up-close foodie photographs. Presentation is everything. And so, I present to you, a little bit of tongue-in-cheekiness. Mariah, Grant, and I had dinner on Friday night with Mariah’s college friend, Tom. He took us to a restaurant where he used to work and we enjoyed a delicious meal of fresh seafood. The thing about seafood is that I generally find it tasty, but I’m a bit intimidated by its natural packaging. I hate peeling and de-veining raw shrimp, and getting mussels out of their shells totally freaks me out. Give me a skinned, boned fish fillet, and I can make a decent meal. But there’s no way I’d ever crack open a crab leg or lobster claw. Gross. Despite my prejudices, on Friday night I experienced a first in a lifetime of eating seafood: raw oysters. Yes, ladies and gentlemen, I picked up half an oyster shell, slurped the meat up, and swallowed it whole. It tasted pretty salty and sort of like a pickle. While it’s not a new favorite, I was definitely glad I had done it. 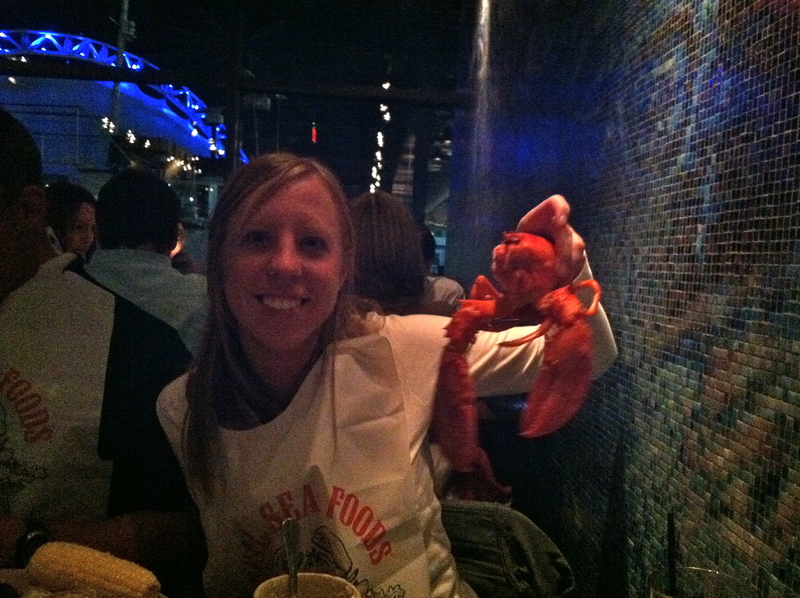 Plus, I felt super brave, even as I sat across the table from Mariah and Grant and watched the Minnesotans gleefully break apart and chow down a whole lobster. I wasn’t gonna get near that thing.